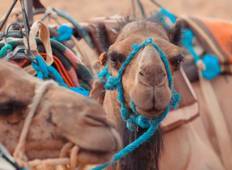 Find a Christmas & New Year trip that explores West Africa. There are 249 tours to choose from, that range in length from 3 days up to 28 days. The most popular month for these tours is December, which has the most tour departures. "Good tour! Mustangs was a great guide." "more activities, more and better information from the guide"
"The food was excellent, the group leader went over and above call of duty, he has..."
"An excellent tour. We were lucky to have a small group of 6 in our tour group which..."
"Wow.. This tour exceeded all my expectations. Hicham was an incredible guide - extremely..."
"it was AMAZING, I could not believe the sheer beauty and homelyness of the country,..."
"AMAZING!!! I have been on multiple group tours over the last 10 years and this was..."
"My husband and I really enjoyed our time on tour. We loved our guide Abdelrehman..."
"Phenomenal experience transportation excellent, food delicious, are tour guide was..."
"Great tour covers everything we wanted to see in Morocco. Our guide was incredible,..."
"The tour was great.The guide is very helpful and very kind ." 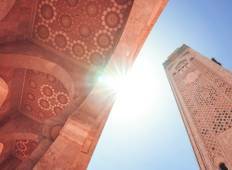 "Great tour that provides a general overview of the main sites in Morocco. The tour..."
"Hotels were not up to par. Many were tired and in need of repair. You should review..."